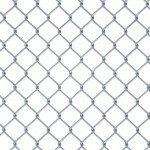 Chain link fence has been the fencing standard for nearly 100 years. Galvanized Chain link fence began with Galvanized After Weave, GAW, in the early years by applying zinc to an unfinished raw steel previously woven product. That product continues today as it has for years. New technology has allowed for the introduction of Galvanized Before Weave, GBW, chain link fence in the early 1990’s to the extent of making a product comparable to the GAW in coating and life expectancy. Galvanized Before Weaving, GBW, chain link fence is manufactured from wire that has been strand galvanized to exact coating weight standards at our Norman, Oklahoma facility, prior to being woven into chain link fabric. Galvanizing Before Weaving, GBW, allows Southwestern Wire Inc. to produce chain link fence for a variety of uses with different coating specifications. I know from experience that my pet needs that the fence be very smooth and free from sharp edges, the smooth finish on the wire will protect children as well as pets from harm and at the same time present a low maintenance perimeter that will keep intruders at bay. It is also the hands down choice for weaving and manufacuture all all smaller meshes from 1″ down to .375″. Galvanized After Weaving, GAW, chain link fence that is manufactured from wire that is woven in it’s raw form or “black” then galvanized in it’s woven form at our Tulsa, OK location. GAW, chain link has been the standard for many years and has a rough appearance to the finish of the wire. It has proven great for security and industrial applications. For your standard residential use, we provide 12.5 and 11.5 gauge galvanized chain link with several mesh sizes. Simple and clean, galvanized chain link fencing will give your yard that classic look, while giving you the assurance your fence will endure. If you’re seeking fencing for commercial, industrial or security use, we provide 11, 9 and 6 gauge galvanized chain link and a mesh size done by individual request, with as small as .375″ mesh available. Whether you’re trying to hold in or keep out, chain link fencing is your most cost effective product.